Mr. James Newby, Sr., age 94 of 37 Bottoms Way Drive, Bear Creek, NC passed on Saturday, February 2, 2019. James Newby Sr. was born on January 27, 1925 to George and Norina Newby in Siler City, NC. James continued to live in Chatham County where he met and married his wife Bernice. Soon after, he went to serve in the Army, WWII and was stationed overseas for most of his military career. Together James and Bernice moved to Bear Creek and started a home and family. James led a long career as a truck driver for CC Routh and later retired from Kayser-Roth. 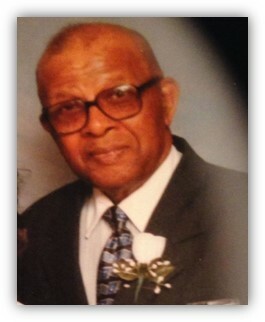 James was an avid member of Mitchell Chapel A.M.E. Zion Church for 75 years where he served on the usher board and sang in both the Male and Senior choirs. In addition, he was a member of American Legion Post 283 where he served as adjunct, chaplain and president. James Newby departed this life on February 2, 2019, just six days after his 94th birthday. He was proceeded in death by his father, George Newby; mother, Norina Newby; daughter Norina Newby and wife Bernice Newby. He leaves to cherish his memory: his children, Lynda Partin (Elbert), James Newby Jr., Lula Irby, Annette Foxx and Reginald Crutchfield; his grandchildren, Kimberly Tyson (Gary), Tanya Urban (Danny), Bryant Irby, Shonda Tuck and Jasmine Newby; his great-grandchildren, Ashly Tyson, Carrington Tyson, Alexis Tyson, Ariyan Walden and Tyler Walden and a host of other relatives and friends.